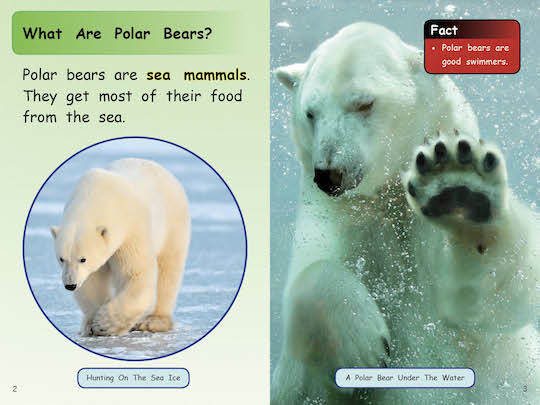 This book is about some of the animals that live in the Arctic. Look at the front cover of this book. How many animals do you see? Can you name them? As the winter snow begins to melt many different kinds of birds return to the north to build their nests.During the short Arctic summer their eggs hatch. The chicks grow quickly. They must be ready to fly south with their parents in the fall. Follow the return of the birds through the seasons. You know a lot about frogs, bears, eagles and ravens. Can you use what you know to solve the puzzles in this book? Mother Bear asks Little Bear what he would like to eat. What do you think Little Bear would like to eat? Bald Eagles have white feathers on their heads and tails. They have dark brown feathers on the rest of their bodies. They have sharp curved beaks. What else do you know for sure about Bald Eagles? This book is about bears. There are many kinds of bears. What do you know for sure about bears?